Brie Bella addresses her bad botch last year on RAW that knocked out Liv Morgan! Brie Bella was the subject of quite a bit of scrutiny from wrestling fans last year after she returned to the squared circle from a near two-year hiatus first in the Women’s Royal Rumble, then again following SummerSlam in August. 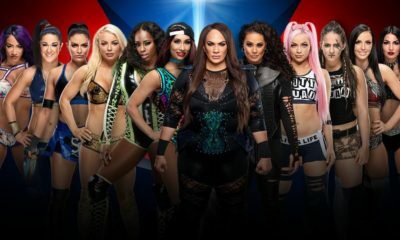 Brie would reunite with her sister Nikki as well, eventually leading into a match at WWE Super Show-Down in October alongside Ronda Rousey against The Riott Squadd. However in the weeks leading up to the event, there was a match on Monday Night RAW that really made Brie the object of a lot of negativity after a couple of errant kicks legitimately knocked out Liv Morgan, giving her a concussion. “Yes, it definitely is [important to have Total Bellas as an outlet to tell her side of the story], because first off it’s crazy how I’ve been wrestling for 12 years and one of my major mistakes in the ring I get judged so harshly on. We’re not perfect, no one’s perfect, you know how many people have been injured in the ring? But for some reason I was like showcased in such a way of like, this evil person, and ‘look what she’s done’ and I got bullied really bad. I wanted to run into a cave and you’ll see. I don’t think people have ever seen me break down as bad as they will during the whole Liv situation. I went into deep depression. I didn’t know if I was going to be able to go back to work. All the horrible things people were saying about me, I felt a thousand times worse than the things they thought of me and I really had to sit down and think to myself, ‘Brie, you’re a mother’ and if Birdie was in this situation would you want her to feel this bad or would you want her to stand up to it and be like, ‘screw you guys’? You can check out the entire conversation at this link. 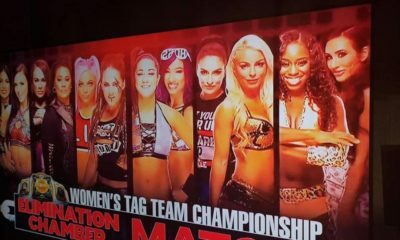 Women’s Tag Team Elimination Chamber Teams Revealed? Will Candice LeRae Turn Heel With Johnny? News involving the Viking Name Change, Star Moved To Raw, AEW Signings and More! News here! Viking Name Change, Star Moved To Raw, AEW Signings and More! Many fans and wrestling personalities commented on the War Raiders name change to the Viking Experience. Now, it looks like the WWE has changed the teams name again. They will now be known as the Viking Raiders according to their WWE.com bio. I get that WWE wants to name outside teams with their own in house names, but I still don’t understand why they were renamed from War Machine. I could have lived with War Raiders as well, but what do I know. Earlier today, we told you about the superstars that are moving to SmackDown Live. 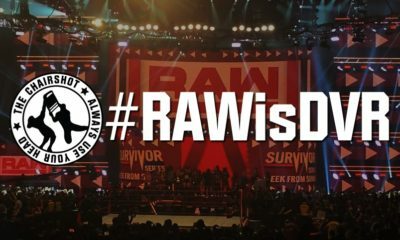 Now it appears that a superstar from the blue brand will be moving to RAW. POST Wrestling is reporting that Cesaro will be moving to RAW, effectively ending The Bar. Cesaro and Sheamus had a great run as a tag team, and its a shame that both of them are not moving over to RAW, as I feel there is still some mileage left in the team. AEW continues to add talent to what is already shaping up to be an impressive roster. The signings include Leva Bates, Peter Avalon, and the tag team Private Party. I’ve said it before and I’ll say it again; AEW is already shaping up to have one of the more impressive female rosters in North America. Here is hoping that it will live up to the hype. SHANGHAI, China and STAMFORD, Conn. — WWE today announced that it will return to China in search of the next generation of Superstars by holding a talent tryout in Shanghai, its largest tryout in China to date. The four-day tryout, from Monday, July 15, through Thursday, July 18, will give up to 50 male and female athletes from China the opportunity to showcase their abilities, with the goal of being selected to begin training at the state-of-the-art WWE Performance Center in Orlando, Fla. This isn’t your father’s WWE. Hell, this isn’t the WWE from when I was younger. WWE continues to search and find talent to bring in to the company. You can say what you want, but the company does a great job in tapping into the foreign talent markets. Did Charlotte Flair have anything to do with this? Three talents get shaken up once more: Andrade, Zelina Vega, and Aleister Black head to WWE Smackdown in a WWE Superstar Shake-Up reversal. In a surprising move, WWE has changed the profiles for Andrade, Zelina Vega, and Aleister Black to the blue brand, WWE Smackdown. Black was assigned to Raw during the Superstar Shake-Up, and Andrade and Vega were moved there in a spot that saw Andrade get a clean victory over Intercontinental Champion Finn Balor. The internet, of course, immediately jumps to conclusions about the Latin representation of Smackdown (Rey Mysterio was also moved to Raw), as well as the relationship between Charlotte Flair and Andrade. Aleister and Zelina are married, and WWE has been trying to keep couples together. Do you think Charlotte Flair is responsible for this move? I stand in the middle! I know, I don’t do that often. But Andrade to Raw made a ton of sense, as he can be a workhorse there and eat up TV time by putting on great matches. Smackdown is loaded (even more so), and I really hope 3 people move back to Raw in the process. As for why? This can definitely be a case of “LOLCHARLOTTEWINS” as she and Andrade are of course an item. If so, that shows how strong of a pairing Zelina and Andrade are if she went with him, and since Zelina and Aleister are married, Black goes as well. I could see the four of them traveling together, honestly. UPDATE: Aleister Black is now officially listed on WWE dot com as a SmackDown Superstar as well. His profile states: "After the 2019 Superstar Shake-up, Black set his sights on changing the landscape of SmackDown LIVE."